I have started this post 16 different times. I have quoted Tolkien, waxed poetic about the impact hiking the AT had on my life, and began to tell the story of my friendship with Carrot. None of it worked. No intro led perfectly into what I want to write, and I can think of nothing to set this post up as poetically as I had hoped. So, I will just write. Our lives are demanding, by choice. Carrot and both aspire for some pretty lofty physical goals while working long night and swing shift hours. Carrot has completed many triathlons over the past two years. She recently accomplished her first Ironman and CRUSHED it! Sick and wounded she started the race in good spirits and ended it strong. Completing an Ironman was a bucket list item for Jen and I was lucky enough to have been there to cheer her on. It was truly inspiring. This coming year she has her sights set on a few more tri’s with another Ironman distance set for next fall. I have no doubt she will accomplish any goal she sets for herself. She is one of the strongest women I know. 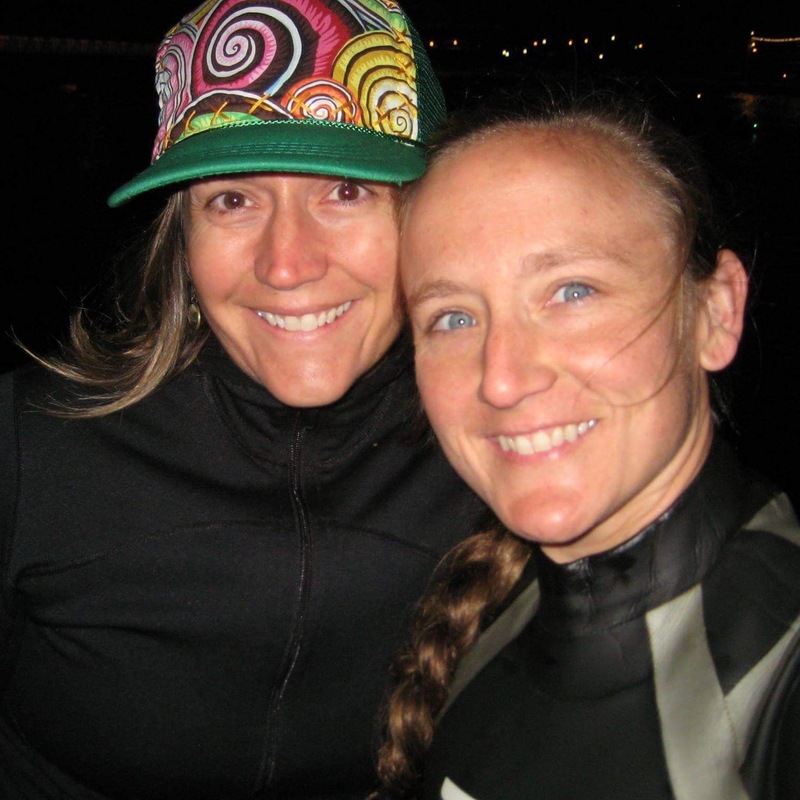 This past year I finished a deep open water swim with a friend that we relayed. 6.2 miles total, both swimming 3.1 miles. I also finished a 1.4 mile ocean swim/race. In 2016 I hope to accomplish many more swims with the longest being a 5k, solo. I have registered for my first Ultra. In June I will run a 50k trail race in Bryce Canyon, UT. Jen will be there as my support. We love a physical challenge and know from past experience that we do our best when we are side by side. We continue to push ourselves at work getting upset when we feel we have lost knowledge or have to advocate a bit too hard for our patients and their care. I may be a type B personality and she may be type A, but together we both aspire to better at what we do and will always be growing. We both love to be challenged. For those who do not know I am currently living in HI. I have a good job and can enjoy perfect weather for outdoor activities year round. I have met an amazing group of people and have friends here that I will keep for a lifetime. Carrot is in Atlanta. She is near her family and also has a great job. She is settling in and creating a wonderful life that is perfect for her now. We are 6,000 miles apart. We talk and text daily. We know about each others life down to the most minute detail. She can probably tell you what I had for breakfast, and I can tell from our texts what time she fell asleep. She is my person. I am hers. My mother said it best recently describing us as “sisters of the heart”. The past 2+ years have not been easy for either of us. My marriage ended and I faced illness and injury. I moved far away in hopes to heal my heart and was met with a few obstacles. A year and a half later I am starting to feel like myself again. I am healthy and beginning to feel “whole”. I am at last ready for some new challenges. I am reclaiming myself physically and am finding peace with love. I have my family and my friends, both new and old, to thank for this. While I am a bit of an introvert and loner, I am also aware that I would not be where I am without the love and support of these amazing people that have graced my life. Jen’s hurdles have not been that different. I am not at liberty to write so freely about her life but suffice it to say that she too has been met with a big move, heartbreak, and the love and support of her family and friends. She is squaring off with her challenges and conquering them with strength and grace. While hiking the AT I adopted a mantra. Strength, Endurance, Grace, Acceptance (SEGA). I would say these words as I climbed, crawled, and clawed my way towards our goal. I strongly feel that this is our mantra. I continue to use these words to get me through a workout or a challenging shift. I feel we both use this mantra to help us get through our days and our lives. I am very aware that we are not any different than anyone else. Everyone has hardships to overcome. We all deal with injury and illness. We all have to conquer this thing called life. Everyone just handles it differently. What does all of this have to do with anything? Carrot and I have simply realized that there is never a “perfect” time. You have to make a list of your priorities and goals, and you have to put a plan into motion. In 2011 Jen and I made a commitment to thru-hike the AT. I made a move from Germany to AZ to live with and train with Carrot. Carrot made the move to AZ from WA to start our training for the first of what we hoped to be a three year journey. Our goal was the Triple Crown. The AT, the PCT, the CDT. A very lofty goal. We accomplished the AT, not without hardship or heartache. It did not go as planned, but then we have come realize most things do not. I believe there is a saying out there about “the best laid plans”. Our lives have taken many different turns over the past two years, but about a month ago we did it again. Truly not much differently than we did the first time. Organically, 6,000 miles apart, in a conversation post shift we decided to commit. Together we agreed that there is never a perfect time and that if we want to do something we need to take action and begin to make the changes and arrangements necessary to accomplish a second thru-hike. Yes, you guessed it, we have committed to the PCT. April, 2017 we will set out to hike from Mexico to Canada on the PCT. Thrutrailchicks is now up and running again as a training and gear blog as we map out our ideas and plans to conquer yet another long distance trail. This was always the goal. The AT (my dream), the PCT (Jen’s dream), and then the CDT (combined desire). We will not talk of the CDT. The AT taught us that goals of this magnitude are indeed best met one step at a time. Anything can and will happen. However, we are a bit stronger and wiser. I feel we are better prepared to accept the challenges we will face. Slightly less naive we will put into place a plan to hike. Starting now we simply place one foot in front of the other. We hope you will join and support us along the way. Strength, Endurance, Grace, Acceptance. Welcome back to Thrutrailchicks. Let the journey begin.